Welcome to Beginner Quilting Resources! Whether you are new to quilting, just looking for ideas, or have some experience we are sure you will find some great quilting ideas here. We also have help to turn your hobby into a great quilting business. Quilting has been done for many years and is well known all over the world. It has changed over time, as it began to fill a basic need for warmth, but is now an art form. Today, the art of quilting has become quite popular as there are many more women and men who take up quilting and enjoy the craft. For any craft as old and as common as quilting, there is no doubt that millions of crafters will be found throughout the world, with millions of different styles of quilts. There are so many different types of fabrics, colors, and patterns available. You are only limited by your imagination. Quilting is a hobby that allows you to add a personal touch, making your next quilt your unique creation. Making a quilt is an enjoyable past time for anyone interested in fabric, patterns, sewing and embroidery. It can be very relaxing and provide a source of pride and accomplishment when you complete a project. With just basic sewing skills you can make your first quilt. If you can cut fabric and sew in a straight line, you can make a quilt. Also it does not require a large investment to get started, with just a few basic tools and some scraps of fabric, you can get started. 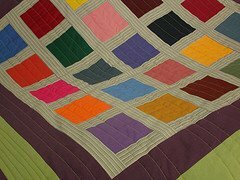 Additionally, quilting often results into something useful that can be given as a gift or used in your home. It is also possible to turn your passion into a profitable quilting business and share your skills and knowledge with others. To get started, browse through the articles and get some basic tips, ideas and instructions for your next quilting project. Thank you for visiting Beginning Quilting Resources!